Peel the dark skin of Kanda and clean it. Cut the vegetable into big cubes and put them in a microwave safe bowl. Add a little water and cook in microwave oven on high power for 5 minutes. Stir once and mash the vegetable lightly while it is still hot. Cover the dish and keep it aside. Wash and clean the Bachhalikoora. Chop the greens finely with a sharp knife and take them into a microwave safe bowl. Cook the greens in microwave oven on high power for 3 minutes. While still hot mash the cooked greens with a masher. Cover the bowl and keep it aside. Wash and clean Green Chilies & Ginger. Make a coarse paste of green chilies and ginger in a mixie and keep it aside. Take tamarind in a microwave safe bowl and add little water to soak it. Place this bowl in a microwave oven and microwave on high power for 30 seconds. Cool the cooked tamarind and grind to a fine paste in a mixie. Keep the tamarind pulp aside. Heat a pan and add oil to it. When oil is hot add fenugreek seeds and black gram. Fry till the seeds start changing color. Then add mustard seeds and cumin seeds. Fry till the seeds splutter. Add the ginger-chili paste and fry for a while. Add turmeric powder, red chili powder and mix well. Add the cooked Kanda and Bachhali and mix well. Add some water to the curry and mix. Now add salt to the curry and cook covered on slow flame for 5 minutes. 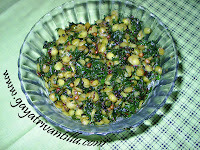 While the vegetables are getting cooked let us make AAVA for the curry. AAVA means mustard paste seasoned with red chili. Break a red chili into small bits. Take 1tsp of mustard seeds in a mortar and pestle. Add the red chili pieces and powder them. When they are coarsely powdered add some water and grind to get a paste. A nice aroma of ground mustard fills the space. 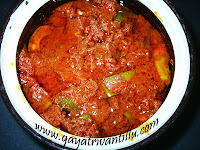 Remove the cover and add the tamarind paste and AAVA to the curry. Cook covered on slow flame for one minute so that all spices get mixed up nicely to flavor the curry. Stir once and transfer the curry to a serving bowl serve hot with plain rice. 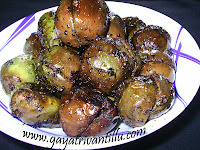 Kanda is a vegetable which works well for those who are suffering from menstrual problems. It is good to eat this vegetable before menstruation for easing the pre-menstrual problems. It helps in maintaining endometrium, protects against breast cysts, natural anti-depressant and helps burn fat for energy. Add green chilies according to your taste. I have added red chili powder to bring color to the dish. Bachhali Koora is a leafy vegetable which is high in Calcium, Vitamin A and C, also rich source of Iron and chlorophyll, also low in calories by volume and high in proteins per calorie. Prepare eat and serve these health benefitting vegetables to your family members and ensure good health. Thank you sooo much for ur wonderful website. Nenu completely dependent on your website.Chala chakkaga chepthunnaru anni vantalu.emanna doubts vachina edhanna theliyandhi cheyyalanna ventane mee site open chesi chustha.ninna Kakarakai koorina koora chesa.chala baga vachindhi.And eeroju kandha bachali chesa.Inthaga mee site follow avthu meeku thanks kuda cheppaledhu anipinchi blog cheshtunna. THANK YOU VERY MUCH FOR YOUR WONDERFUL WEBSITE.IT IS REALLY VERY VERY HELPFUL.